The city will vote on a plan to increase taxes on lighting and landscaping for certain parts of the city at Tuesdays meeting. If the plan is approved, the city will send out a mail-in ballot to the affected districts. If the majority of ballots returned are in favor of the taxes, they will take affect later this year. There are two lighting districts in town, and five landscaping districts. All will be charged at different levels if the citys plan is approved. Meanwhile, the city is also sending out sample ballots with a city measure for renewing a $5.5 million user’s utility tax without opposition arguments. The utility tax ballot measure, called Measure C, will be on a county consolidated ballot on June 3 if the Board of Supervisors approves it this week. So many taxes, so little time. Looks like West Covina is getting ready to open a new Home Depot on Thursday, at the Heights shopping center at 2220 South Azusa Avenue. I wonder if officials are concerned at all about the problems other Home Depot communities like Baldwin Park face with day laborers? My colleagues tell me nothing has been mentioned yet. But I can almost guarantee the issue will come up in West Covina eventually. 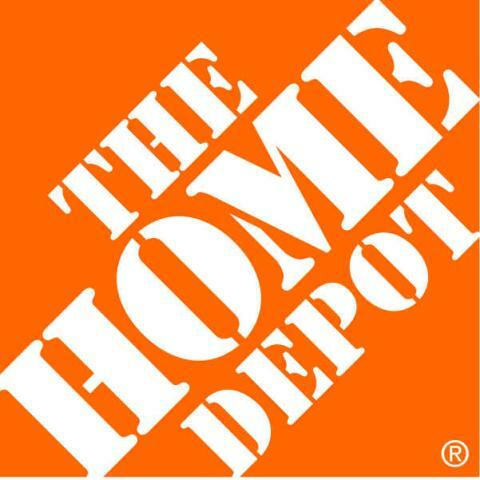 Even Home Depot officials have admitted that day laborer concerns are a constant problem at most of their locations. Baldwin Park is closer to appointing a new police chief, and El Monte police Lt. Ken Alva is in the running. Councilman Ricardo Pacheco said he thinks theres truth to earlier rumors Alva was already being courted for the spot before former Police Chief Edward Lopez left in February. Pacheco and the association claim Lopez was fired by the City Council in closed session. City officials say Lopez retired. Chief Executive Officer Vijay Singhal told me today he and Recreation and Community Services Director Manuel Carrillo are narrowing down their top picks from a pool of about a dozen applicants for the departments top spot interim Police Chief Michael Taylor is among the applicants. But the most interesting part of this story is that rumors are flying that Mayor Manuel Lozano and Councilwoman Marlen Garcia are already introducing Alva as the new chief to business owners and Chamber of Commerce reps. When I called the chamber today to confirm, a secretary answered the phone and seemed more than willing to patch me through to the chamber president. After putting me on hold for a few minutes, she came back on the line as said the chamber knew nothing about the issue. Lozano also denied the allegations but said he was invited to an informal meeting last week with Alva, two former council members, the chamber president and several business owners. The straw breaking your city’s back? Montebello is one step closer to ensuring that its city and fire departments is kept under city control and not turned over to the county, Amanda Baumfeld reports. The City Council on Wednesday directed staff to draft an ordinance that will require a vote of residents to transfer the city’s police and fire departments to another entity. The ordinance will be added to the city’s municipal code. The issue raises an interesting question about cities that have their own fire and police services, and at what cost is it to the residents. There are some cities, such as Irwindale, population 1,600, Covina, population 46,830, and Monterey Park, population 62,150, that have its own police agencies. There have been stories, such as out of Vallejo, reporting that cities funding the pensions of fire fighters and police officers is going to break their budgets. “Meanwhile, Vallejo faces soaring payroll costs for its firefighters and police officers, whose pay and benefits make up nearly 80 percent of the city’s general fund budget.” Read more. But everyone agrees that we need these services. So how do we deal with it? Is turning to the county the answer? South El Monte, Diamond Bar and Rosemead, for example, all rely on the Los Angeles County Sheriff’s Department for their services. Are the cities happy with the services? I’ve heard complaints in the past out of South El Monte. I wonder what the cities pay for county services compared with what cities like Montebello are paying for in-house services, and how the whole pension system works with the county? That’s right, I’ve received several calls from a woman who claims a landlord in Baldwin Park is forcing tenants from his two apartment buildings to get rid of all their pets. The informant and I haven’t been able to connect so I don’t have all the details yet. But in her messages, the informant claims there “are children involved” and the matter is “devastating” for the tenants. To be quite honest, I’m not quite sure what, if anything, we are going to do with the story. I still need to find out how many pets we’re talking about here. Don’t get me wrong, I have two kittens and if my landlord all of a sudden told me I had a week to get rid of them, I’d be pretty miffed. But I’m not still not sure it’s newspaper material. No doubt about it. 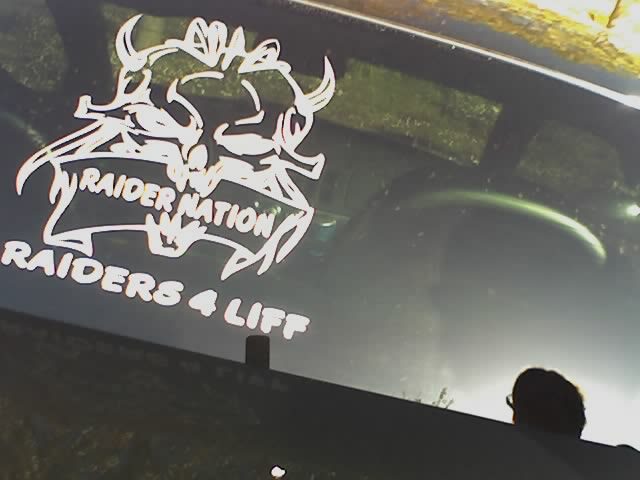 This says “Raiders for Liff.” I spotted it while visiting my family in the Bay Area. Would you expect anything less from a Raiders fan? Kidding, kidding. A story I wrote last week titled Cultural Upheaval is still getting comments. The story focuses on the resignation of the president, Robin Hu, who said he left because the chamber is too political, the books are kept poorly and they aren’t doing enough to embrace different cultures, particularly the Asian community. In Rosemead, every time I write in stories the “council minority” when I refer to Councilmembers Gary Taylor and Margaret Clark, it does not just refer to how they are outnumbered by Councilmembers John Tran, John Nunez and Polly Low. No, Clark and Taylor truly represent the minority race in Rosemead. But I can tell by the off-the-cuff remarks and the anonymous comments that there is resistance or denial to these changes. So will we see that story? Not until someone is willing to talk on the record. And what would that story say? If done right, it would tell the story of changing demographics, resistance to change, how minorities are becoming empowered and how the old majority feels slighted. And I can’t think of a better example a community that is dealing with this change than in Rosemead, as symbolized by the council members: two caucasian council members. How many people does it take to satisfy a records request? I know, Sunshine Week is over. But remember how I said pursuing a transparent government is an every day thing for us at the Trib. Well, on Thursday, I drove out to Commerce to a law enforcement task force to take a look at some documents I requested. It took four people to answer my request, and they all stared at me as I reviewed a public record’s request. Four people. Talk about an intimidation tactic. They wanted me to process the informatin immediately and ask any questions I had at that point. Now, I’ve got the smarts and all, but I usually like to read over the information in private, figure out whether it makes sense, talk it over with my boss, write out my questions, and then follow up with any other questions. So when I asked if I could call the exectuive director if I had any other questions, they told me no. I have to go through a attorney. But, the attorney warned, if I had any follow up requests, I should be advised that she will notify me within the 10 days that she received my request but wouldn’t actually respond for at least five weeks because she has a trial. Is that even legal? Arg. It took me until today to decompress. Those are just a few of the places are trusted local legislators visited in 2007, spending hundreds of thousands of dollars on travel, restaurant and resort fees, according to reporter Dan Abendschein’s investigative story on campaign records for locals pols’. Not to worry, that’s not taxpayer money they’re using. No, it’s money from political contributions – I don’t know whether to laugh or cry. Is it just me, or did anyone else think that campaign contributions were supposed to go toward, oh, I don’t know … campaigning? Calderon’s last election was in 2006. His next election isn’t until 2010. On the flip side, state Sens. Jack Scott, D-Pasadena, and Gloria Romero, D-Los Angeles, as well as Assemblyman Mike Eng, D-El Monte spent zero dollars of their campaign contributions on travel. Hope that was enough to lure you into reading the complete story…. Seems like the Iannones over at Ed Butts Ford aren’t the only ones with some harsh words for La Puente’s redevelopment abilities. Victor Gudzunas, who owns the Hacienda strip mall on Hacienda Boulevard – which is home to about a dozen tenants – is accusing the city of “ripping my heart out” in the eminent domain process to seize his land. La Puente first filed eminent domain paperwork with the courts last summer for the land, deeming it blighted. Mayor Louie Lujan has said if the city has any hope of developing a commercial retail center on the old La Puente Lanes bowling alley site, it needs Gudzunas’ land too. But Gudzunas is holding out. And in the meanwhile, him and his attorney are accusing the city of undervaluing his land by $4 million. City appraisers value his property along the city’s main thoroughfare at $3.8 million. Gudzunas’ appraisers say its worth well over $7 million. Talking to Gudzunas and his lawyer John Murphy last week, it was clear they felt city officials were inexperienced with redevelopment and were “botching” the eminent domain process. A little bit of context: La Puente formed its redevelopment agency in 2003, but didn’t actually begin receiving funding for the agency until 2005. Gudzunas’ Hacienda strip mall is the first piece of property the city has ever tried to take through eminent domain. If built, the Hacienda retail project could be a prime destination spot for residents in and out of La Puente, officials have said. In response to Gudzunas’ allegations, Lujan said he respected the city staff members and consultants determinations about the land, its value and other key points. He also said he hoped the city and Gudzunas would be able to reach a settlement before a May trial date. Look for the story in Sunday’s paper.